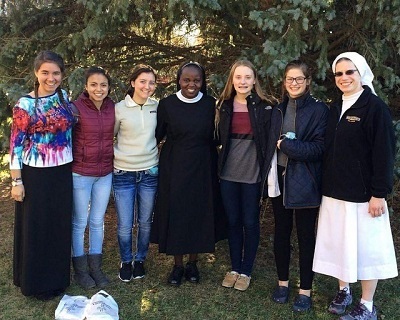 During mid-Advent, our community in Norfolk was blessed to have a brief 24 hour vocation visit by four young ladies who are students at Heelan. Father Shane (our school chaplain), my fellow teacher Laura, and I brought our four students to Norfolk to meet the Sisters and learn more about our Missionary Benedictine life. We were joined by Katelyn, a sophomore at Briar Cliff University in Sioux City who is also discerning her vocation. The students had many questions about our life in Norfolk, and very much enjoyed their immersion experience with us. A wide variety of our Sisters spent time with them throughout the weekend giving input on mission, vocation, monastic life, and prayer. Father Shane and Sr. Inviolata gave a talk with discussion about discernment, which the group enjoyed. 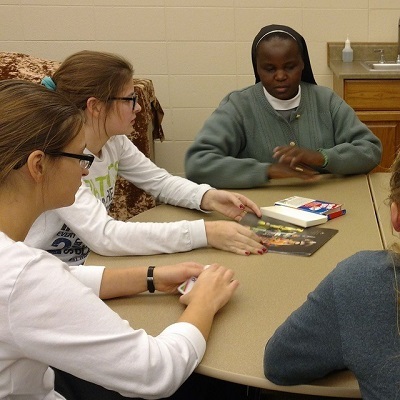 Later, our students spent time playing cards and games with our Novice and Postulants, as well as members of the formation team and vocation team. Laughter and joyful conversation pervaded this lovely evening. The group joined the Sisters for the Divine Office, meals in the cafeteria, and in other informal settings like dishwashing. The girls were amazed to meet Sisters from so many different countries and cultures. They had no idea that they would find this kind of internationality in Nebraska, and loved it. Father Shane and I hope to bring upperclassmen to see our monastery in Norfolk in the coming semesters, and are grateful for the gracious hospitality of our community in Norfolk during the recent visit by Bishop Heelan students.